Hi there! I’ve got a couple of new things to share today. One is a wearable muslin for a new pattern and the other is my third attempt at a pattern I’ve tried a few times. Together they feel like summer! Let’s start with the new pattern. This is the Sway dress by Papercut Patterns. I wanted to test the fit of the neck/arm portion before making the full dress since it uses quite a bit of fabric. I fell between an XS and S on the size chart, so I cut between an XS and S. I wanted to do french seams, so I used a 1/2″ SA instead of the 3/8″ included in the pattern. I also decided to skip the facing and bias bind the neck and arm scyes. The fit seems spot on with no adjustments. And I’ve already cut out a dress. This is made in a fabric that’s new to me. It’s a nylon-tencel blend and comes in a wide range of colors at Stonemountain. Although I think it’s only available in their store. Obviously I couldn’t resist buying a yard to try out. I wasn’t sure what to do with it, so decided to risk using it for the test version. And I’m glad I did – it’s a good fabric for a full swing shape! It’s really light and a little crisp and doesn’t seem to wrinkle as much as rayon. It is a little shifty to sew – more like silk than rayon. It feels really nice to wear and I’ve already bought a couple more yards, though I haven’t decided what to make – ideas? The second garment is an Everyday Skirt. I bought this pattern shortly after it was released because it looks a lot like an old favorite J Crew skirt. The sizing on this pattern is really generous. My measurements put me at a size S, but it was just way too big. I tried again in an XS. Better, but there was still a lot of extra fabric. This time I removed an extra 2″ from the front panel and the back panel. I was a little worried about there being enough room to pull over my hips, but it’s fine. In fact, I could probably take out another couple inches. I also shortened it by 4″ and I hand stitched the front waistband for a cleaner look. I suspect some of the sizing problem is because I like to wear skirts just below my natural waist and this skirt is intended to be worn lower. This is made in a 100% woven ikat, also from Stonemountain (and available online). The print varies a bit since this is handwoven and I definitely didn’t want to mess with lining it up across seams. So I cut the sides, waistband and pockets on the cross grain. It’s very satisfying to finally realize my vision for this skirt and I’ve already worn it several times! I’ll end with a question for you. Have you tried Liesl & Co. patterns and have you found that they run large? Or do Papercut Patterns run small? What about other designers? I’ve made the Everyday Skirt and it definitely runs big! I really love it, but I would size down next time … that said I also like to wear skirts at or near my natural waist, not on my hips. As far as Liesl’s patterns generally, I can’t say, since that’s the only one I’ve tried, but I haven’t read that about her other patterns. I LOVE this outfit. So simple and chic. I need more of this kind of easy summer outfit. You look great. Thanks! It’s a great skirt pattern – and good to know that you had the same issue with sizing. I’ve admired some of her other patterns but wasn’t sure. If I try one I’ll be sure to report back. What a great Combo! Can’t say anything about Liesl&Co pattern but I think Papercut papperns don’t run small.. I think you did a great job in cutting the panels crosd grain, looks great. And I also like the Shirt, the fabric looks beautiful! Maybe make a dress from it? Thank you! I didn’t plan to wear them together but sometimes it just works out that you sew an outfit. I’ve got 2 yards of the fabric so a dress is a definite possibility. I love your outfit! 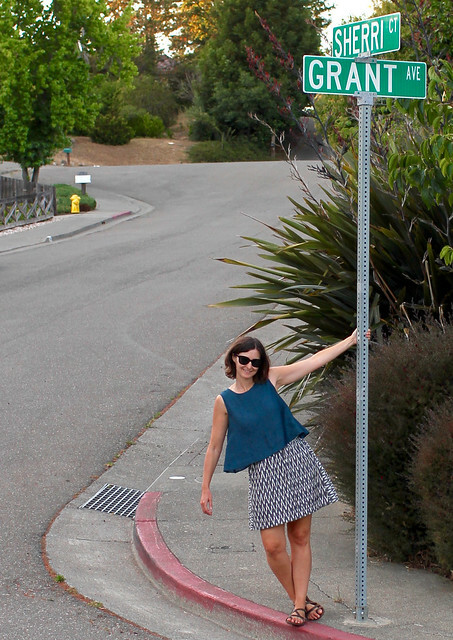 The everyday skirt does run large – I make a small and it’s plenty large still for me (typically more of a medium). The other Liesl / Lisette patterns I’ve made are more true to size, in my opinion. I just made (another) everyday skirt in AMH’s new loominous and did the same as you – cut the sides on the crossgrain. 🙂 Yours is super cute! 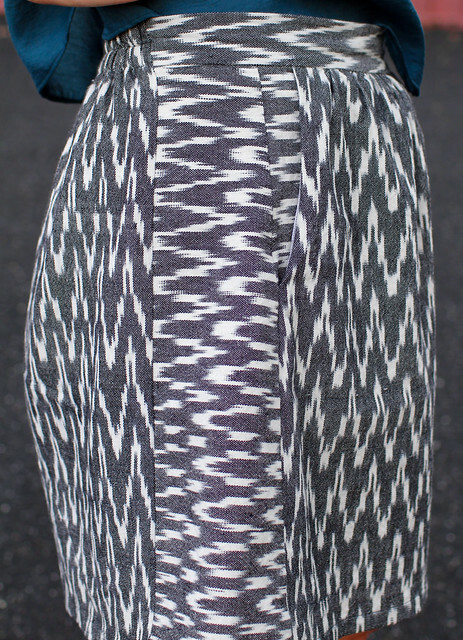 PS, I first saw stonemountain’s ikat on the adelaide dress by seamwork and I can’t get it out of my mind now! Gosh – they have so many that I still want to buy… it was really lovely to sew and has a great texture! Cute outfit! I’m swooning over that skirt, both your fabric choice and the pattern are perfect. A skirt with pockets! Yes please! This is adorable! What a fantastic pattern. I love the fabric mix and you look great in it! Thanks Carolyn! I’m tempted to pick up some more ikat just so I can play around with directional stripes. Fun!